Tech Dreams: Bored of Standard Google News Interface? Try Image Version Interface. Bored of Standard Google News Interface? Try Image Version Interface. If you are bored of standard version of Google News, try quite interesting and useful Image Version interface of Google News. Image Version of Google news shows latest stories as a gallery of images that you can explore. Click here to see it or go to normal Google News and click the "image version" available on the left side. Hovering over the images will dynamically show the news description on the right hand side and clicking on the image will forward you to the news report. 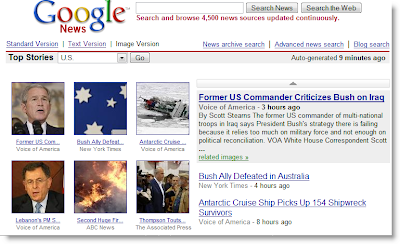 The image gallery view of Google News not only works with front page news, but also you can search(demo) for any news and the results are shown in the image grid view. For quick overview of news this interface is more friendly than the standard view.